Did you know that many cousins don’t share enough measurable DNA to get caught in DNA application filters? By using the GEDCOM search at GEDMatch.com you can find people who have your relatives in their family tree even if you only share small amounts of DNA. DNA sharing takes certain patterns. You will share a healthy amount of DNA with your immediate family members and your first, and second cousins. Odds are that you will share some DNA with your third cousins. But, beyond that, it’s anyone’s guess. Not all cousins will share DNA. The Genetic Genealogist has some interesting statistics on this. In fact, it’s possible for a person to share DNA with one cousin and not the other—even though both cousins are from the same parents! I should know because it’s happened to me. I share a chunk of DNA with a third cousin, once removed, but only a tiny amount with his sister. GEDMatch doesn’t consider me a viable cousin for the sister. Thank goodness I have the documents to prove it! If you use the default settings at GEDMatch when looking for matches, it’s entirely possible to miss cousins who you share smaller amounts of DNA with. Genetic genealogy is complicated. This guide provides the basics so you can get the most out of your DNA research. There are ways to get around this. By using the GEDCOM search, you can identify people who have their family tree in the database. Have you ever wondered if the person who has a family tree online but not contacter information has done a DNA test? If they’ve uploaded their DNA and GEDCOM to GEDMatch, you can find them. 1. Log in to GEDMatch.com as usual. 3. Enter some search terms on the search form. 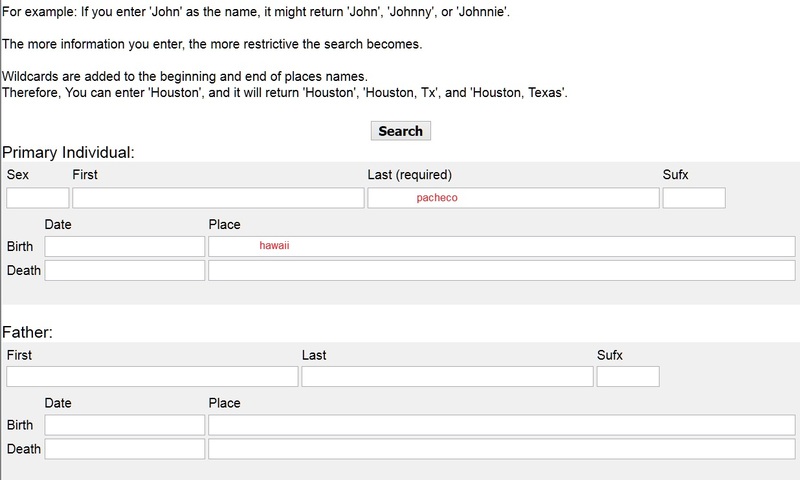 Last (Surname) is required for all searches. If you have a really unique surname, start with that. Otherwise, start with a surname and place search. Enter the surname you are looking for in the Last box. Then, enter where they were from in the Place box for birth or death. It’s best to start with as little information as possible. Go general and get more specific. You have no idea how the person entered names or places into their family tree. You might have Kilauea, Hawaii. They may have Kilauea, Kauai Co., HI. This holds true for names, too. You have no idea if they are using the name on the birth certificate, marriage certificate, death certificate, the one their grandma told them, or a modernization of the name. Work your way from general terms to more specific searches depending on how many results you get. Names like Antonio might be found as Antonio, Anton, Antone, Tony. Sousa might be Souza. Try all the variations you can think of. You will see a list of results that meet your criteria. The columns are: date uploaded, email address, GEDCOM number, and ancestor information. Now, let’s look at those results. I removed identifying information to protect the privacy of submitters. 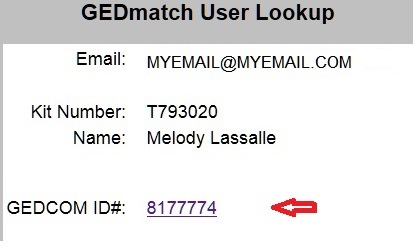 You will see the full email address and GEDCOM number in your search results. Before you email that person, you can find out more about how much DNA you share and who else shares DNA with you. You’ll need their GEDmatch kit number to proceed. 1. 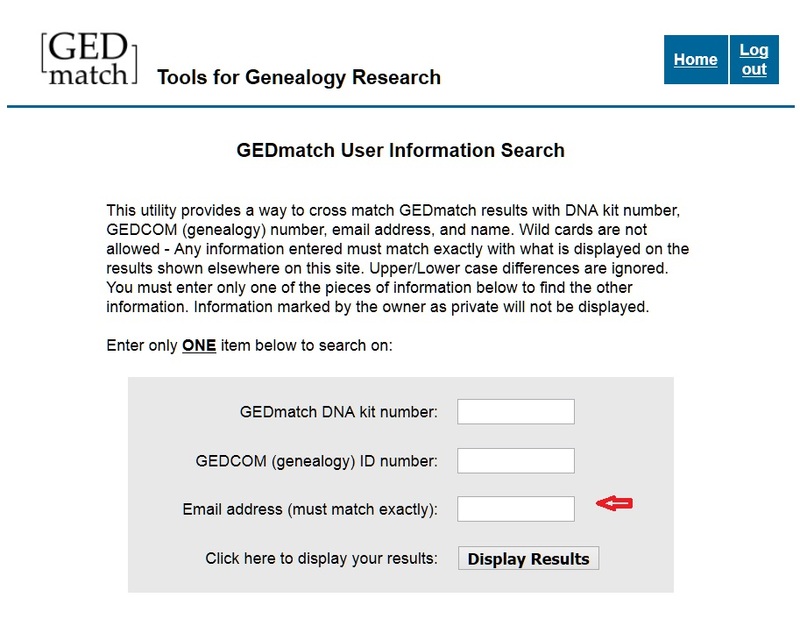 Return to the main screen of GEDmatch. 2. In the left hand column under “Learn More” select User Lookup. 3. Enter the email address you found on the GEDCOM search results screen into the appropriate search box. You’ll see all the DNA kit numbers this person had uploaded. Write down those kit numbers, then use the comparison tools “One to One Compare” or “Multiple Kit Analysis”(if you have more than one kit number to work with) to see how much DNA the two of you share. This is my kit number. Go on, go and compare yourself to me using the “One to One Compare” Tool. Be sure to let me know if we’re a match! The best thing about finding these cousins is you can use the information to help sort through your other matches. 1. In the middle column, select “People who Match One or Both Kits”. 2. Enter your kit number and the person’s GEDCOM kit number. 3. Leave the rest of the fields as is. You can play with them later if you like. Click Display Result. This list shows you everyone who shares DNA with you and your GEDCOM cousin. Check off the boxes by the email addresses, then click submit. Now you can see who shares the same DNA sequences. This information can help you determine which lines your matches come from. 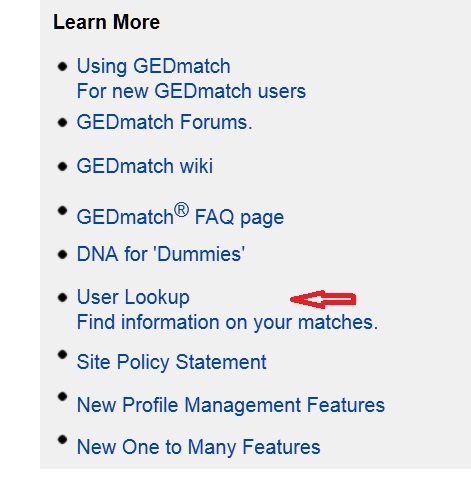 You now have two different ways to root out your matches on GEDMatch. Play with the searches and see if you can find someone else researching your family tree. 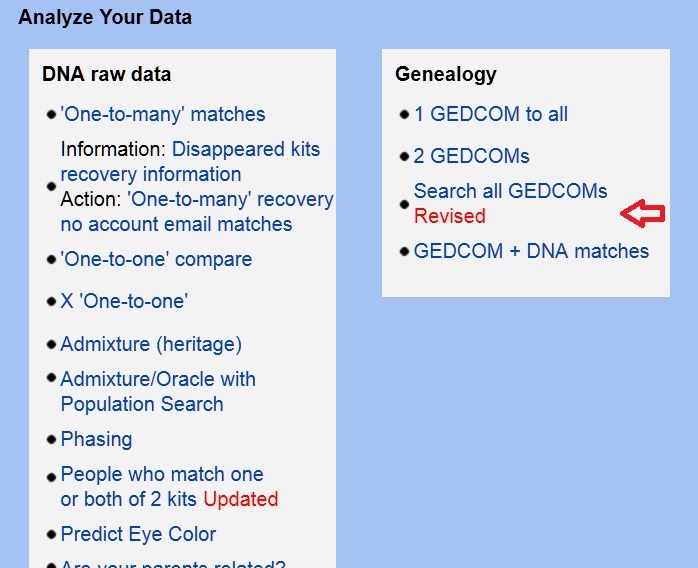 Remember that the GEDCOM search only works if someone has uploaded their GEDCOM file along with their raw DNA files. That reminds me. Have you uploaded your DNA raw files to GEDMatch? Have you also uploaded your GEDCOM file? If not, please consider it. There are people trying to figure out their DNA matches and your pedigree chart could be the key! may help you interpret your own DNA results.